Anyone keeping half an eye on the blogs over the past 18 months has witnessed the steady appropriation of the term Blairite by the old hard left of the Labour party and its Guardianista fellow travellers; the term has undergone a deliberate transmogrification into a synonym for rightwinger or even Tory. At Left Futures, we plead guilty to using the term. Not as “playground namecalling” of the sort to which (in the article) they plead guilty (“We started it. We called everything pre-1994 ‘Old Labour’ “). Nor simply to mean Labour rightwinger. There is a difference ideologically between what we term Blairites and the traditional right of the party, social democrats in the Crosland tradition who support a significant role for the state, equality & redistribution, who support trade unions and their role within the party, and who recognise class as a key determinant of inequality. We use the term precisely to distinguish between the two. The suggestion that the left are somehow involved in an Orwellian attempt to destroy ideas by manipulating language is risible. If anyone in the Labour Party has been guilty of manipulating language for political ends, it is New Labour newspeak that talks of public service reform when it really means marketisation and privatisation, of the choice agenda when it means competition and so on. 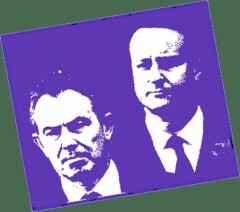 In reality, the Blairite project still pursued by Progress is wedded to backward-looking concepts rooted in neo-liberalism, which clearly failed with the collapse of Lehman brothers, and were progressively rejected by the electorate between 1997 and 2010. The idea that anyone in 2012 is attacking and abusing Progress because they can’t overcome the strength of Blairite ideas is about as daft as when Militant used to say the same thing in the 1980s. The desire to “kill Blairism” on the other hand is real and widely shared in the party and in the unions including many on the right as well as those on the left. It exists not because Labour is “more angry at Blairism than with Cameron and Clegg” but because Labour members and trade unionists see the damage that Cameron and Clegg are doing to Britain and they know that Blairism laid so much of the foundation for that damage. Introducing austerity. Privatising public services. Attacking the poor. Failing to regulate the financial sector and allowing private (not public) debt to get out of control. Many in the party and trade unions regard Blairite ideology as alien to the Labour movement and outside the definitions of democratic socialism and social democracy. We share that view even though we do not seek to exclude anyone from the party. And, yes, we want our party back. Posted in: Activism, Ideology, Labour, Left Futures, Politics. Do the Blairites actually agree with IDS over making people work for nothing? Making Labour policy: who calls the tune? Exactly so Jon… a very good riposte to the nonsense. the article is now online, and rather good it is too.